Mr Millington said: “It was a fantastic weekend. Thanks must go to each organising committee for working so hard. 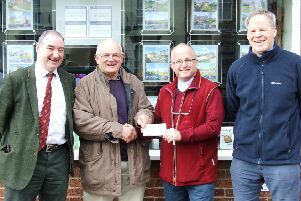 “That said, the weekend could not have been a success without the support of the Horncastle public. “Once again, they turned out in huge numbers to support what was the largest Remembrance Parade we have seen. Mr Millington stressed the work of the branch would continue, with 2019 marking the 80th anniversary of the start of World War Two. New members are always welcome to join the RBL, including non-Armed Forces personnel. • Meetings are held at The Admiral Rodney, in Horncastle, on the second Monday of each month (7.30pm).